Cut your advertising budget down to just pennies. The kit provides you with dozens of more effective marketing strategies that will eliminate any expensive paid advertising AND bring you better results. The kit provides step by step insider secrets on how to get 100's of new customers by utilizing free tools such as Facebook, free online directories, and DIY printables that only cost pennies to create! Easy edit templates for printables & social media marketing are all included! Effortlessly Get More Customers With The Kit's Referral Coupons- Print Yourself For Just Pennies! Customer Referral Coupons will easily motivate your current customers to refer you to their friends. 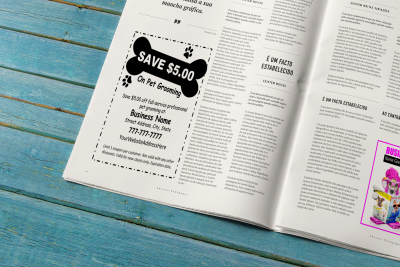 There are printable Customer Referral Coupons included with both editions of the Groomer’s Profit Kit. For best results, we recommend having a stack of them displayed right near your checkout counter so that customers will grab one. 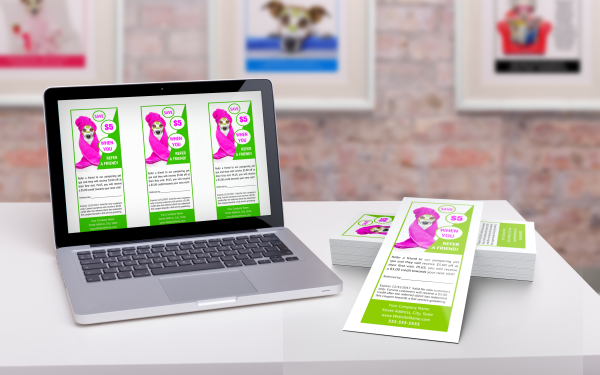 Our Advanced kit includes over 40 template designs to quickly create & print your own customer referral coupons for just pennies. 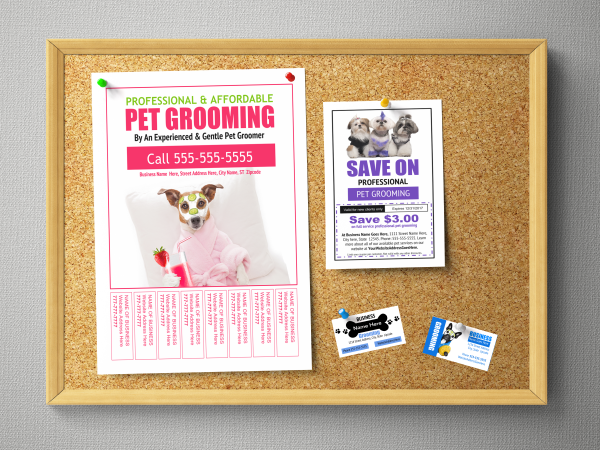 Bulletin board flyers , business cards and coupons offer an effective yet inexpensive way to promote your pet grooming business around town. 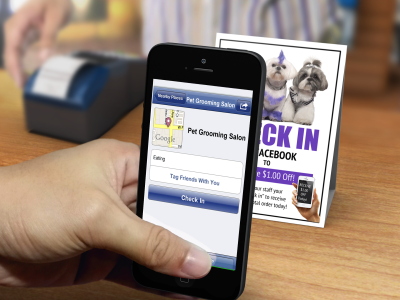 Post them at veterinary offices, pet stores, shelters and any other local business. The kit has over 850 easy edit templates that make it quick, easy and inexpensive to quickly print out these cheap marketing materials right from your own computer. These also work great for local events, trade shows, and booths! Set-up the perfect Facebook page for your business in minutes with our cheat sheet guide and easy edit templates. Quickly master Facebook marketing, Pinterest marketing and other social media marketing. Our Quick Start Guides will show you how to get a ton of new customers by simply using these free & massively effective online tools. (Printable signs included in the Advanced kit) Every time a customer “checks-in” to your business fanpage, it automatically gets blasted out to all of that person’s Facebook friends. Giving you instant credibility and word of mouth advertising...all for free! Details and printable sign templates are included in the Advanced Groomer's Profit Kit. If you like to run print ads, the kit will help you discover cheaper, more effective ways to run them. Newspaper/Print Ad templates are included in the kit. Discover the secrets to running cheaper, more effective print ads that actually bring in new customers without costing a fortune. 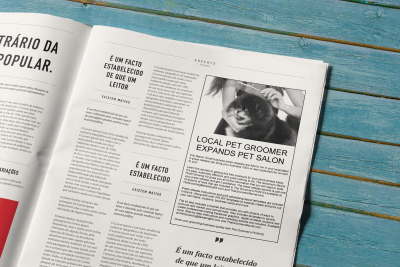 Flyers can be used to bring in more grooming clients. Our Advanced kit's templates allow you to create your own flyers in minutes and print them up for as little as .02 to .05 cents a piece. 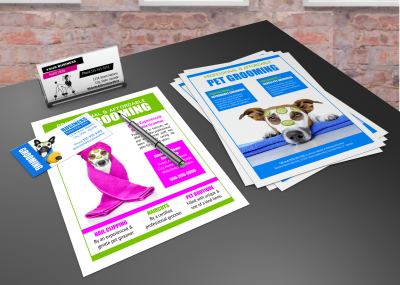 Half page and full page flyer templates are included in the Advanced Groomer’s Profit Kit. As well as digital versions that you can post on your social media pages and website! Learn How To Get Free Local Newspaper Press Releases Published! So how do you go about getting free publicity? It’s actually quite easy. You write and submit your own press releases. Press Releases are free and you can write one anytime. Just simply follow the instructions that are included in our Advanced Kit and use the included sample press release template. The kit provides you with everything you will need to quickly produce your free press releases and get them published. 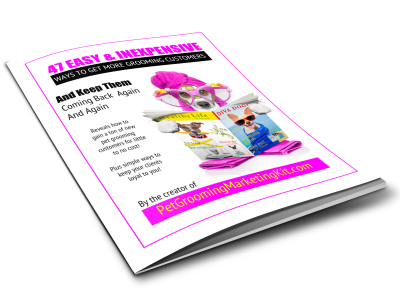 All editions of our kit include our popular Ebook "47 Easy & Inexpensive Ways To Get More Customers" It will provide you with effective marketing ideas that are no-cost and low-cost. Also includes a section on how to keep customers coming back to you again and again. 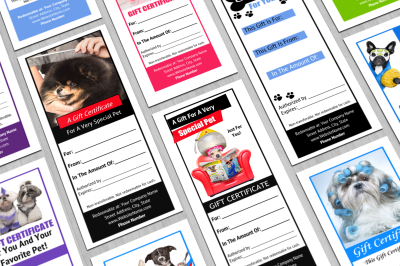 (printables are included with kit) Don't miss out on the opportunity of gaining new grooming customers by selling grooming gift certificates. What a bonus it is to gain new customers every time a current customer pre-pays for a new customer to come see you! Chances are good that the new customer will return as a paying customer. Effortlessly sell gift certificates all year long by simply displaying a voided gift certificate. About 90% of consumers are now utilizing the internet to search for services instead of the phone book. And you do not have to spend thousands of dollars on a website in order to benefit from the internet. Believe it or not, if you can type out an email, then you have all of the skills that you need. Plus, if you are on a tight budget, you can even do these projects for free! The Advanced Groomer's Profit Kit will show you how. 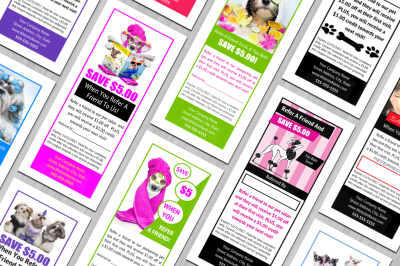 Also includes website banner templates and digital coupons templates. 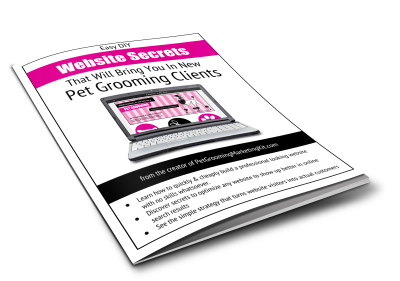 Includes monthly strategies to bring in new grooming clients. Included with all editions of The Groomer's Profit Kit. 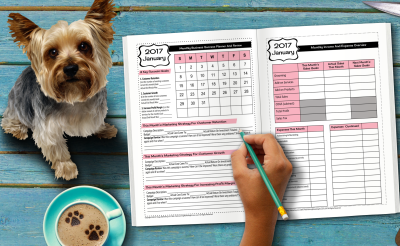 A 2019 Groomer's appointment book & marketing planner designed to take your grooming business to the next level!